Forgot about Darkness and ended up rage-eating a Diamond for the Mono Light Achievement using dual Erza. Finished farming with dual Ying Zheng, which doesn't really need a strat. Cleared the 3+ Races and same Leader-Ally Achievements using dual Yusuke. Wave 4.1: Grind through, using CD6 Spirit Gun and Raizen for Hearts as needed. Wave 4.2: Spin through, using CD6 Spirit Gun or combo skill if up. Wave 5: Stall CDs back. Wave 6.1: Spin through, using CD6 Spirit Gun and Raizen for Hearts as needed. Wave 7: Stall a bit to get rid of the debuff. 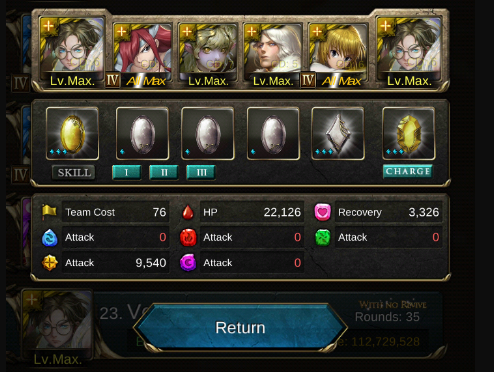 Wave 8.1: Grind with CD6 Spirit Gun and Raizen for Hearts. When 4 Weathered Runes appear, Honda and whiff. If not dead, Transform Yusuke and Mega Spirit Gun. Wave 8.2: Burst with untransformed Yusuke's Spirit Gun, then Transform. If not available, Transform, then Spirit Gun. Wave 9: Transform Florice and remove debuff. Wave 10.1: Burst with Nyx + Spirit Gun + Raizen + DC, dissolving for AOE. Wave 10.2: If you couldn't break DEF of the right part, you end up here. You should be able to tank Khaos, even with his ATK increase against Demons, so just kill the right part manually. Wave 10.3: Mega Spirit Gun. Sound advice. Most budget teams just need a little def break to ensure the killing of both sides then u can tank phase3. The problem i figured out is that zeus has no hp so if u manally clear his 8 combo shield he might die. A better solution is to kill zeus and use the dc the next rd to kill both sides. At least that is my opinion. This way there is no worry on zeus terminat.